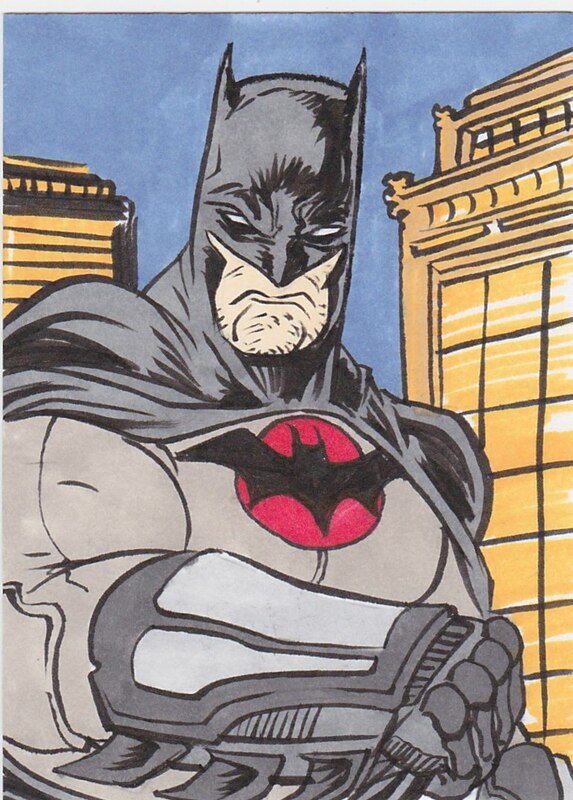 I've been meaning to scan and post my Batman sketch card pages but other things have gotten in the way. I figure cranking out my 1000th blub of foolishness would be a good time to post at least some of them. 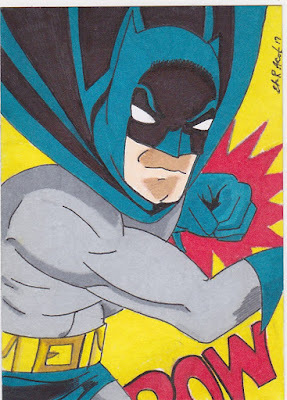 I'ts fun to see the various artists' 'take' on Batman. 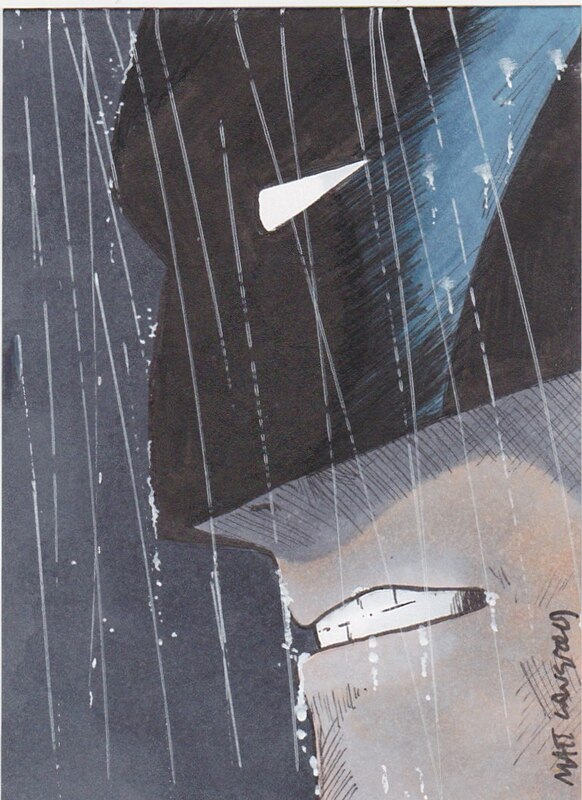 I think he's gone through more changes over the years in print, film and television than any comic book hero. I've tried to gather cards that reflect all his different 'personas'. 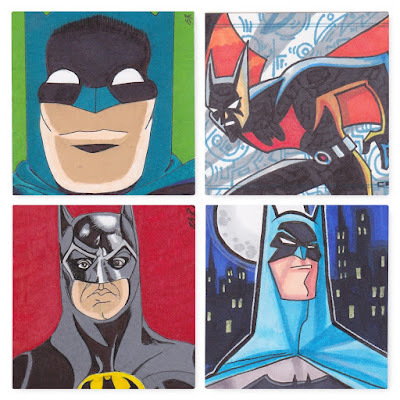 Obviously some of these are based on the different movie/TV actors who have portrayed him, some on the various cartoon incarnations that have come and gone. Others just have a fantasy feel to them. 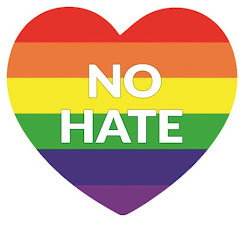 But I enjoy each one. 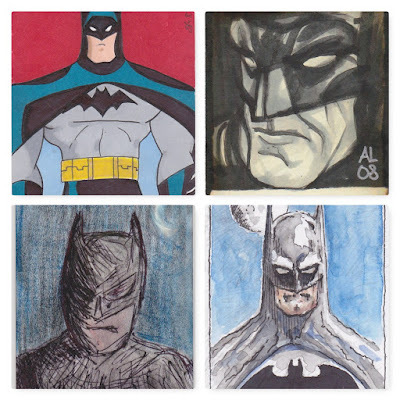 At this point I have 26 sketch cards including a couple from the 2013 Cryptozoic Batman The Legend set. 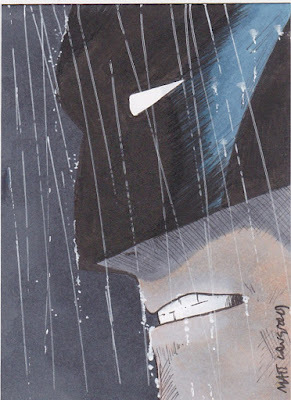 I also have a Joker sketch card from that set and two of the card sized art prints. 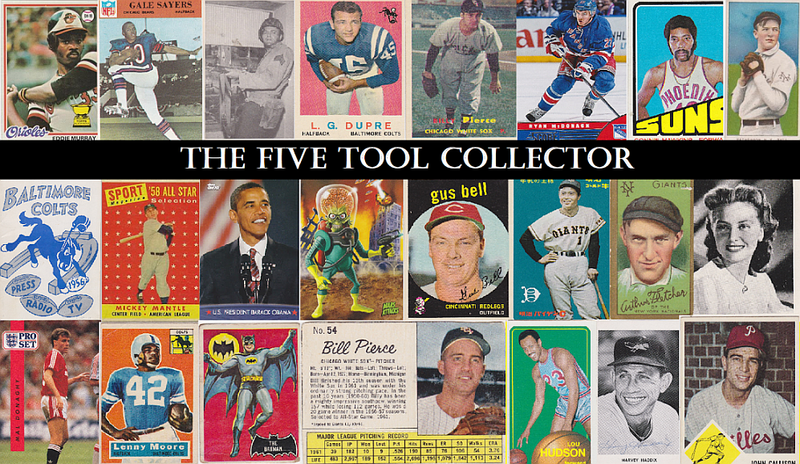 I intended to gather just nine, enough to fill up a binder page and keep the total cost under $75. I have met that goal in a roundabout way. I can definitely stick nine of these in a sheet whose total cost would be under the $75. But after I bought about half a dozen I began looking at some more costly ones and grabbed a few. I'm going to break these into two posts. 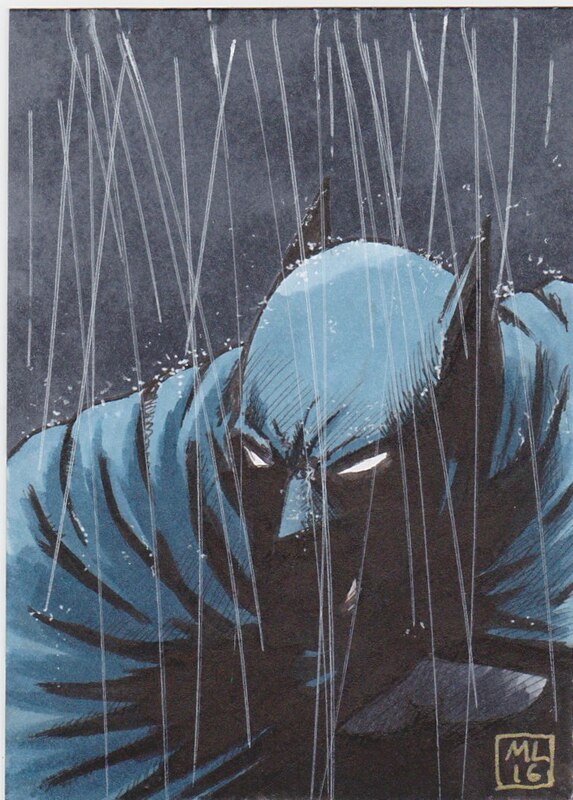 Up top is a Michael Keaton interpretation and just below is one of several sketches I have that show Batman in the rain and darkness. 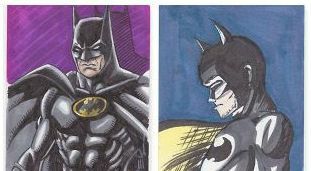 I have several sketches by Ellyn Acord. She sketches the 'classic' Batman. Here's one of the Cryptozoic cards. This is a unique card that features his with a red symbol on his uniform. Another Ellyn Acord piece. Again in the cartoonish style. I'll post the rest in the near future. 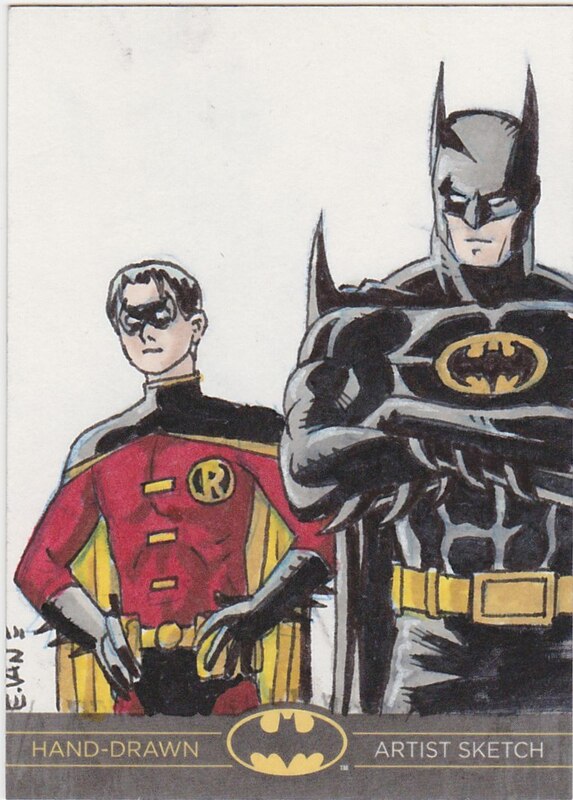 Wow you've got an impressive sketch card collection going there. That Michae Keaton one you led off the post with is fantastic! Congratulations on reaching 1,000 posts! Congrats on post number 1,000. I'm far from that on my blog (3 blogs total) if I combine their totals (which I did about a week ago when another blogger mentioned their 1,000 post blogiversary) I get approx. 900 published posts with 31 now in my draft queues. 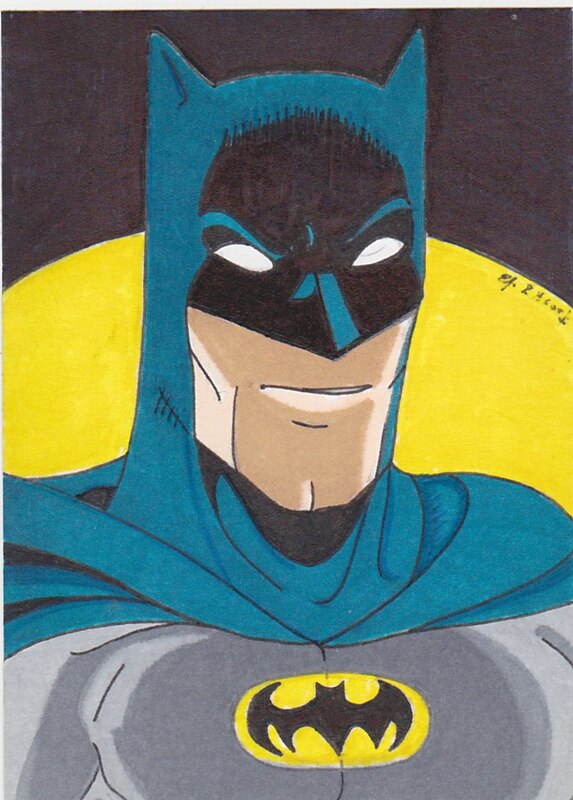 I generally prefer "Graphic Novel Batman" over "Motion Picture Batman", which is probably why I really like the second of the new sketch cards. It's got a Frank Miller-y vibe about it (and may very well be (*ahem*) inspired by "The Dark Knight Returns"). Congratulations on hitting your 1,000th post. 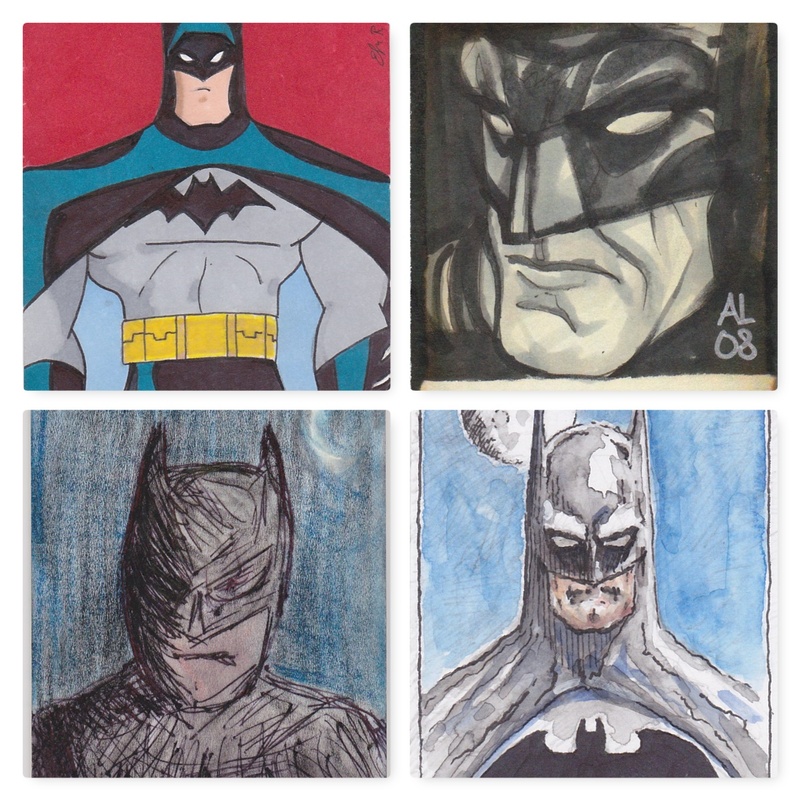 You have a great Batman sketch card collection. Congratulations on your 1000th post! 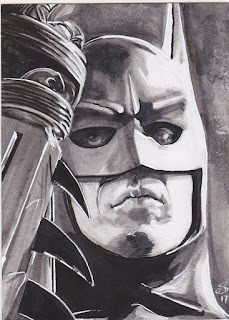 Nice collection of sketches. My favorite among the new class is that "cartoonish" one by Ellyn Acord. Great stuff.